forced to the helm 27 years ago. AFTER retiring from 27 years at the helm, Michelle Nugan can now invite friends to share a very special drop with her on the many big occasions that lay ahead – Nugan Estate's Chief Winemaker, Daren Owers has created an exceptional wine in her honour under the label Nugan Estate Matriarch McLaren Vale Shiraz 2006. Thrown into her role after the unexpected death of her husband Ken, who died within six weeks of being diagnosed with cancer in 1986, Michelle found she'd inherited a business that she says, at best, could be described as faltering. "I would like to recognise the support of my children Matthew and Tiffany during those early days as CEO," she says. 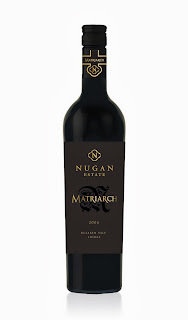 "But together with Daren Owers and his winemaking team, I believe Nugan Estate has gone on to become one of Australia's great family success stories." Daren's drop created to honour Michelle is a real cracker, and while in the top-shelf price range at $65 is worth every cent: sourced from the family's premium 11ha vineyard in the McLaren Vale region of South Australia, it's a wonderfully rich and full-bodied Shiraz with an elegant – and seductive – palate of opulent dark fruits layered with dark chocolate and anise, silky tannins and well-integrated oak. Reward yourself with a bottle (or two) at that next very special occasion – and raise a glass at the same time to an amazing lady after whom it is named. of another more refined and elegant. ONE TO NOTE: THE recently-released 2011 Angus the Bull Cabernet Sauvignon marks the end of an era – and the beginning of another. Created a decade ago by winemaker Hamish MacGowan and wife/business partner Brigitte purely for the enjoyment of having a good cut of prime beef accompanied by a great red, up until the 2011 its been blended from fruit from across South Eastern Australia: from the 2012 vintage it will be made from exclusively Central Victoria fruit. This will result in a more refined, elegant and less blockbuster Angus, but still a great partner with a great steak – and if it stays around its $19.95, still great-value buying. PITCHING TO CRICKET FANS – ’OWZAT?